In November, I traveled with my friend Jeff to Myanmar – the emerging Asian travel hotspot formerly known as Burma. After our two weeks exploring the country, Jeff headed on to Laos. My road, however, led to Hong Kong, as I was ready to sample oysters in the sky. The Oyster & Wine Bar, located atop the Sheraton Hong Kong Hotel and Towers in Kowloon is Hong Kong's leading spot for oyster aficionados. It is best known for serving “jet fresh”seasonal oysters from around the globe. Each day, close to two dozen oyster varieties are flown in and served to discriminating travelers and Hong Kong residents. More often than not, when writing for the blog, I opt for a seat at the raw bar to engage with the shuckers as I sample the oysters. However, although the large semi-circle oyster bar was staffed with two expert “Oyster Specialists” surrounded by hundreds of oysters ready to be served, we went with a table by the floor-to-ceiling windows instead. We wanted to enjoy for the panoramic view of the Central Hong Kong skyline across Victoria Harbor. Making this choice rewarded us with an amazing view of “A Symphony of Lights." Hong Kong’s light and laser spectacle which begins nightly at 8:00 p.m. Arriving an hour before the show, we spent time chatting about the evening's oyster selections with the restaurant’s knowledgeable Oyster Specialists. We were told that, on average, the restaurant served 800 oysters per day. While many of the regulars were ordering oysters by checking off a list (as is often done with dim sum in Hong Kong), we relied on the specialists in making our selections. That night, the restaurant was offering “only” fourteen varieties from France: Belon, Charente-Maritime, Écaille d'Argent, Geay, Gillardeau, La Royale Cabanon, Majestie, Ostra Regal, Pascal Breuil, Perle Blanche, Perle Noir, Roumegous, Sentinelle, Special Tarbouriech and Tasarskaya. The USA was represented solely by Pacific oysters: Eagle Rock, Hammersley Inlet, Jumbo Barron Point, Pacific Rock, Shigoku, South Puget Sound Kumamoto, Totten Virginica and Wildcat Cove. There was also one oyster variety from Ireland: Muirgen. In a well-iced open case at the far end of the oyster bar, a shucked sample of each variety of oysters was displayed, along with a small sign indicating the name, the nationality, the unique characteristics (e.g., salty, sweet, mild, fruity, creamy, plump, firm, crispy, etc.) and, of course, the price. Apparently, global airfare for oysters is rather expensive, as the price per oyster ranged from a low of $6.75 (U.S.) to a high of $11.50 (U.S.). That having been said, almost all of the oysters were in the $7.00 (U.S.) range. Having made our selections, we headed over to the table where we were presented with the wine list – on an iPad. This allowed us to sort through the collection by country, wine region and/or grape. Wine Director Ace Lee’s tasting notes for each wine added to the ease of selecting an appropriate wine from such a comprehensive list. Lee’s impressive selection landed the restaurant a Wine Spectator Restaurant Award for 2013. In addition, China's Wine List of the Year Awards recognized the restaurant for having not only the “Best Wine List in Hong Kong - 2013", but also for having the “Best Wine by the Glass List - 2013” for all of China. While much of the wine is beautifully displayed throughout the restaurant, the complete cellar boasts approximately 15,000 bottles. To make matters easy we ordered a nonvintage Brut Champagne – Bollinger Special Cuvée – a rich Champagne with a hint of baked apple tart, which we enjoyed throughout the evening. Soon, our oysters began to arrive two-by-two. Since it was November, we had opted for oysters from the northern hemisphere, particularly the US and France. Had we been visiting in the summer months, we would have looked southward, to Australia and South Africa. We began with our sole oyster from the United States – the Hammersley Inlets from the southern end of Washington State’s Puget Sound. These plump, firm, creamy-white oysters were full-flavored with pleasant cucumber finish. The proved to be a great start to the evening. Our main focus of the evening was the oyster varieties from southwestern France. We enjoyed the Perle Noires (crisp, sweet and savory, with a slightly metallic finish), Geay (tender, crunchy and salty with a lasting finish), Gillardeau (tender, plump, sweet and slightly salty oysters, with a hint of hazelnut) as well as the Écaille d'Argent (crispy, mildly sweet, and also a hint of hazelnut). All in all, we enjoyed an amazing array of oysters, thanks in great part to the recommendation and advice we had received from the Oyster Specialists. Curious to sample some other shellfish before our entrees, we ordered a Queen Seafood Platter ($100 U.S.), which came with North Atlantic lobster, scallops, mussels, clams, crabs and, of course, more oysters! All of the shell fish was just as fresh as the oysters we had enjoyed -- and the presentation was beautiful. The restaurant offers more than seafood, and Chef Oscar Chow is to be commended for his offerings. At the waiter's suggestion, I ordered a deer medallion special, while my colleague enjoyed a classic Beef Oscar. 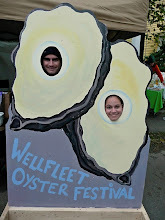 Both were exceptional, but after all, this blog is about oysters, so enough said. All in all, dinner – including the Champagne – was just under $400 (U.S.). An expensive, but worthwhile treat, which I highly recommend. Thanks for posting Josh! Can't wait to visit HK myself. I haven't been back in years. Did you get a chance to check out Oyster Station? That's my favorite little oyster bar in town.